Given to adults age 18 and older. 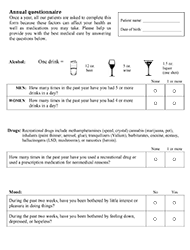 One validated question for adult alcohol use, and one validated question for adult drug use. Positive responses warrant further screening. Includes the PHQ-2 screening tool for depression. Note: not billable using CPT 96160. Given to adults ages 18 and older when positive on the alcohol question on the Brief screen. A “Full screen” that assesses quantity of alcohol use and related consequences. Includes illustrated examples of standard drinks and an extra question about alcohol treatment. Given to adults ages 18 and older when positive on the drug question on the Brief screen. A “Full screen” that assesses consequences related to recreational drug use. Includes extra questions about types of drugs, injection of drugs, and drug treatment. Given to adolescent patients ages 12-17, at least once a year, during any visit. A “Full screen” that measures frequency of tobacco, alcohol and drug use to indicate a possible substance use disorder. Includes the PHQ-2 and PHQ-9 Modified for Teens screening tools for adolescent depression. Given to pregnant and postpartum patients. 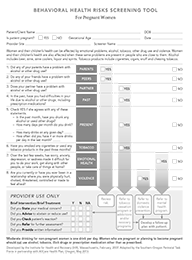 Eight questions screen for use of tobacco, alcohol, and drug use, as well as depression and intimate partner violence. Administered to adult patients age 18 and older, through an interview with a health professional. A “full screen” that assesses severity of substance use. This version is modified to address drug use only. Modified to use language that defines misuse of three types of prescription drugs. Can be self-administered electronically (see screening app page on this website).